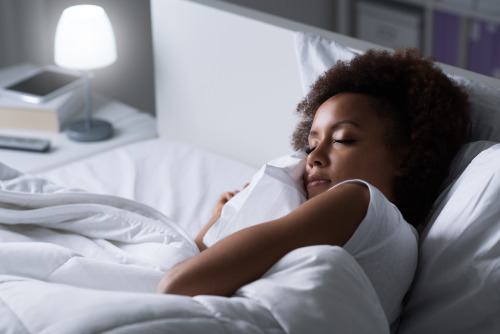 Ironically, some of the latest and greatest tech innovations actually offer solutions that may help us sleep better by teaching us more about our sleep habits. The idea is that we take the data we receive from these various technologies and use it to take specific steps that can help us sleep and live better. Here’s a look at some of the latest technology and gadgets promising to help us get more (and better quality) shuteye. Sleep apps: Apps are a convenient way to track your sleep and can provide tailored feedback around your sleep patterns and how to improve them. Through the Go365® App, you can earn Points for keeping a sleep diary. Log 7+ hours of sleep 5 or more days per week using a Go365-compatible device to earn 25 Points per week. To get started, sign in to the App and go to the Activities section. You can also check out the Go365-compatible Stop, Breathe & Think app, which can help you fall asleep with a short “falling asleep” meditation. Since its part of the weekly mindfulness log, Go365 members can earn up to 10 Points weekly when the app is connected. Download Stop, Breathe & Think through the app store before connecting to the Go365 App. Smart light bulbs: Many of us sit under fluorescent lights for most of the day, which emit a lot of short wavelength blue light. Blue light is good for us during the day as it boosts attention, reaction time and mood. However, too much exposure at night can disrupt sleep. Various companies, including NASA, have created light bulbs that generate less blue light and, likewise, facilitate better sleep. Temperature control systems: Sleep doctors and experts alike agree that a room temperature between 60 and 68 degrees makes for ideal sleep conditions.3 If you’re constantly getting out of bed to adjust the thermostat, consider investing in a temperature control system that offers room by room temperature control. Or, try out a product like this temperature-controlled mattress topper, which cools down or warms up your mattress by actively circulating water through a network of micro tubes. Scented alarm clocks: If you’re one of many who have trouble waking up in the morning, you most likely detest the sound of your alarm clock. Now there’s a more enjoyable way to wake up, and it starts with your nose. Set your alarm, choose a scent, go to sleep and wake to a scent of your choice, from bacon to coffee to fresh croissants. It’s like one of those wall plugins but so much better! This material is provided for informational use only and should not be construed as medical advice or used in place of consulting a licensed medical professional. Consult with your doctor to determine what is right for you. Links to various other websites from this site are provided for your convenience only and do not constitute or imply endorsement by Humana Wellness, its parent company or affiliates (“Humana Wellness”) of these sites, any products, views, or services described on these sites, or of any other material contained therein. Humana Wellness disclaims responsibility for their content and accuracy.